Stage 2 Women share items with men, about women. The motivations for which vary depending on which women is sharing to which man. It can be a nudge to better behaviour or a vote of sympathy. There is a grain a truth in all humour, the older I get the more I realise that this is true and perhaps humour is an outlet for those things we find most complicated and frustrating. The item below represents a misogynist view of women and not to be encouraged in my view. so apologies to all women for this cynical view. 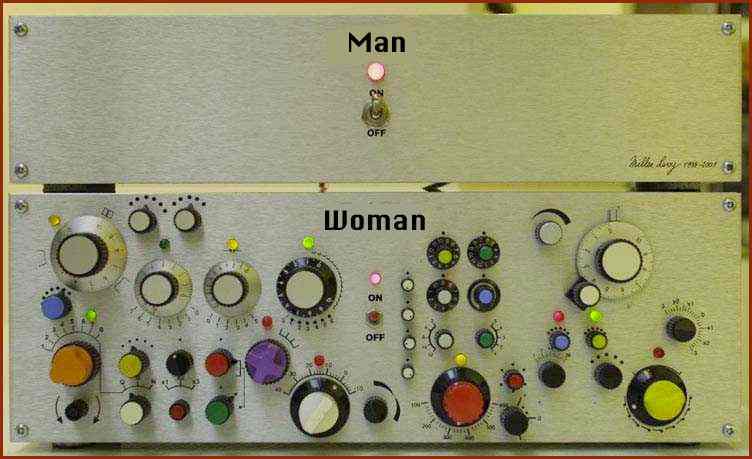 An over simplification of a man I feel but without doubt the complexity of engaging with some people of the female gender can lead to a sense that no matter what one does it is hard to understand the likely impact or reaction. Perhaps the image below is a useful one to explain the challenge of not compartmentalising ones thoughts and allowing them to overflow ones day to day thinking. Focusing on what you can fix, prioritising them in the order of importance and finding a way to cope with that which cannot be resolved surely is the key to achieving balance. The sense that men are purpose and objective driven is clear whilst women like to explore all possible options, which is why there can be real tension when working together. This is more of an indictment of mans lack of desire to have a balanced relationship, without trying to achieve understanding men just give up and do their own thing and we find situations developing where situations get out of control and imbalance develops of years of a relationship.